It should also be noted that at the time of writing, a beta of Google Chrome supports it, and I feel certain the other web browser vendors will shortly follow suit. 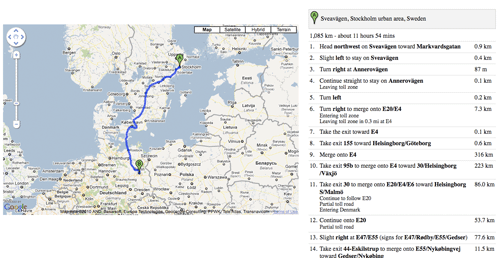 You can see this example in action an try it out at http://robertnyman.com/html5/geolocation/current-location.html. Maps are fun indeed. I did recently some OpenLayers which allows you to integrate tons of different map types (also Google Maps) with one interface. The documentation could be better but it's definitly worth a look if you like maps. Chrome Dev Channel supports Geolocation with the –enable-geolocation switch. Just tested on Mac and works. Opera 10.5 betas and RCs had geolocation enabled however it looks like it has been turned off in the Windows release and on Unix and Mac. Right, I touched on Google Chrome in the post. I've tested the dev release, and it seemed to work fine; however, I never got the option whether a web page should remember my choice or not, it just automatically remembered. It's interesting that Opera decided to take it out for the moment, though. Great article. Indeed geolocation is a hot topic these days. Got to keep a close eye on new implementations and updates to the API. You could absolutely do that, but the example isn’t implemented in that way. Now what my questions are, first I would want the map to first load up with the user’s current location (with a customer marker which will stay in place no matter where the user drag the map to) and then show the restaurant near the current location. And also to display the search query and results on a different part of the page rather then below the map. How would I go on doing that? I believe it’s best to ask that question in the Google Maps Forum. Tried but unfortunately theres no response, and i have been waiting for a week now! Sorry about that. All I can say is try again, and Google around to see if other people have done similar things. well, i am amazed that no one still has discussed aboout geoloations in IE. Mr. Bill Gates IE has a problem with IE. there is no support. everytime it goes to else loop. anyone knows anything about this ? Geolocation has been supported since IE9 and up. Thanks for this. It works great in my browsers. However, it doesn’t seem to work on an iPhone (or the iOS simulator). It asks for my location (which I allow), but then goes to an address in San Fransicso. I live in Indianapolis, IN. Any thoughts? Sorry, no idea. It definitely supports it, so it might be depending on re-routing of your data connection. I’m trying to see the map from the second link but nothing appears here. I’m using the last FF version. Is this occouring only here ? The web browser will ask you if you want to share your location. You have to say yes to see the map and the directions. but i am not getting this ..
is there any idea to do this..
My final theam is i want palce google map(http://maps.google.co.in/maps?&saddr=pune&daddr=bangalore) in small arear of browser that it..
pls let me know any solution.. Please look in the demo page for how to implement it. Hi, is it possible to use geolocation to display the website users current location as text? So for example, in ghe top corner i want “your current location is: ‘location’ “. Ideally then i will only display content related to that location. Then you need to use Google Maps, map the name of the location to the name, and display it. Please read the Google Maps docs for that. How to get destination using origin and distance in miles. You need to check with the Google Maps API for the things you can do. HI Robert, can you input a location ie for a shop and for the user to activate there location so the can have a route to the shops location? Yes, definitely. As shown above, just have the name/address or similar for the shop in your script. Well I have a problem with Geolocation, when the page is initialized I have “right” location, after I refresh the page there are different location, maybe 10 meters from first. After one more refresh I have a third location, etc.. I tested on this link here , and again I don’t have a right position. Geolocation is quite tricky, implementation- and experiencewise, and the result could vary a lot depending on a huge number of factors. sometimes Geo-location failed to retrieve correct location.. I am building small application to get current location details which can installed in mobile.I am using Geo-Location to get current location details.Even-though mobile is in same place for particular duration,geo-location getting different address,latitude,longitude.It doesn’t getting accurate location details. I’m Luis, I’m starting developing in Android, and I need some help. I need to do an application in android where I can get through the GPS location all the trades with some published offer. I’m lloking into the LBS services of Android, but there is nothing about to search offers in a google map. How can I do that ? do you know which source code could I use ? This post is about geolocation with web technologies, not in Android apps. I recommend checking the Android documentation for that. While seeing my position on a map is an obvious usage of geolocation, I am more interested in determining my location and then using that location in HTTP requests to Google for search results tailored to my location. Do you have any example code for that? With Google, if you access it on mobile or desktop, it will adapt results based on your location. E.g. if you try it on mobile it will ask for your location.